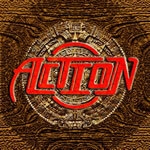 Review: "Action: Action" - Sea of Tranquility - The Web Destination for Progressive Music! You want action? We got Action � retro AOR that borrows from Boston, Def Leppard, Journey, Extreme and even Nelson. (Yes, Nelson.) If music by those bands doesn't interest you, take a pass on this American group that was originally formed in 1985 by guitarist David "Chip" Jones (perhaps best known for his role in Mars Hill). But if big vocals, hook-filled choruses, melodic guitar solos and polished production rock your world, Action's self-titled debut is for you. Granted, the record doesn't sound like it took 22 years to make, but after Action shared the stage with the likes of Quiet Riot, Firehouse, Slaughter, Rough Cutt and Zebra in the Eighties, the band ignored its own name and went on hiatus. For a long time. Now Action is back as if the Nineties never happened. Even the band's logo and Action's cover are soooo Eighties. And despite the lack of an original note on any of the 11 songs here, the band's unbridled enthusiasm and professional approach to this style of music is invigorating. Songs like "Without Your Love," "Here In My Heart," "Is It Love" and "Loveless" rival anything heard on radio back in the day, and Action may still find an audience all these years later among music fans who like the kind of over-the-top melodic rock that once upon a time lit up arenas all across America.